Partners of different zodiac signs bring out slightly different facets of the Libra personality. Some elements however are fairly common to all Libra relationships. Libras exudes a self confidence that is highly attractive. They are sure of themselves and can be master seducers once they set their eyes and hearts on you. They are very good conversationalists and give personalized attention to their beloved. Libra is an endlessly fascinating sign, and even more so when in a relationship. Libras typically shower their lover with praise and affection regularly. They enjoy the finer things in life and this applies to their partner as well. They will appreciate any effort made on their behalf to look nice or any special attention to detail when dealing with them, and typically they will let you know how pleased they are. Libras are typically very affectionate with their lovers and very open and articulate when delivering compliments. Expect any woo to be very direct. It is easy to know what is on your Libras mind, as when they adore something they show it openly. The flip side (which isn’t negative at all), is that when displeased they will typically be quite open about discussing their opinions and can reasonably be open to understanding an opposing view. They may not change their mind, but they will listen attentively and likely have a witty and memorable conversation on the topic. Libras enjoy verbal sparring very much. They are attracted not only to visually attractive people, but especially to persons that are articulate and can hold their attention. Highly social, you can expect to have a busy social life when in a relationship with a Libra. They tend to have many friends, old and new and are very popular amongst groups. Being able to comment on world events or any other topic that you know interests your Libra will score you points. Libras are amongst the friendliest signs, easily creating friendships which may at times be hard to deal with for a partner that is introverted or unsure of themselves. They typically don’t take kindly to a partner that is insecure, preferring someone self confident and as equally well read and/or cultured as they are. Libras are very loyal once committed. Getting them to commit may prove more time consuming than most other signs, simply because they are picky and must make sure they want what they want. This is actually a positive thing, as once their mind is made up, their loyalty more than makes up for any initial hesitation they may have displayed. Libras are literally "fair" minded as their sign symbol indicates (the scales). They are likely to fight fair and part amicably if a relationship ends. There is a lot of conflict on how each sign comes to decisions. It’s as if Aries and Libra exist in different orbits. Aries is in the fast lane and likes to make fast decisions; if it sounds right and looks good, why not, let’s make a decision and get the show on the road. In the mean time, Libra is still at the intersection wondering what way to turn. Libra likes to look at every possible outcome, analyze it, review some more and then procrastinate about which way to proceed. It’s total disarray, which doesn’t concern Aries so much as they just get on with what they are doing and don’t worry too much about anyone else, but if Libra feels rushed or cornered it does present disharmony and this is a serious problem for Libra. Upsetting Libra’s equilibrium is a definite no. Leaving issues to fester into larger concerns can be a problem with these two signs. Neither of them wants to have a confrontation and will side step issues rather than deal with them head on when they occur. They do not want to go into battle over petty issues, and this attitude can lend itself to ignoring the larger issues as well, which can result in small issues building into huge nightmares that can end up exploding. Taurus will eventually step up and say something, however, often it will be when one more thing happens, which can be a minor incident, like the straw that broke the camel’s back, and when Taurus does let off steam, all hell can break out, you do not want to be in the firing line of Taurus’ last straw. This, of course, totally unsettles Libra who hates disharmony, and can’t operate well when there is even a little unrest, yet alone a Taurus hurricane heading towards them. As Libra will not know exactly how to handle all this distress, it sends Taurus into an acute space of silence, and communications between them shut down. Fortunately, time heals all, the Libra charm opens the gates of reconciliation and with Taurus’ need to restore love and regain their level of self-worth, and they can work to get back to where they were - love birds happily nesting. Between them, they’ll never make a decision. Decision making can be a chore for Libra, flip flopping and procrastinating, and Geminis are constantly changing their mind. They like to discuss issues, but Libra will want to be right, and if Gemini can overlook a few differences and agree to disagree, then life will not be too turbulent. Because of their shared mental focus, they may get lost in their minds to a degree that eclipses emotional awareness. It’s a good idea for this couple to forego some of their social or outward activities once in a while and check in with their emotional lives together. Get out of your head and into your heart, in other words. One area of conflict involves Libra’s fundamentally logical approach to life; reason and rational thought go a long way with Libra. Gemini is drawn by their imagination and curiosity, and the twins’ whimsical, imaginative fancies may exacerbate Libra from time to time. Libra loves to socialize - Cancer prefers to stay home. Libra requires a flow of social interactions, while privacy is important to Cancer, who prefers to be by themselves or with their mate, not the large number of friends and associates that Libra collects. Cancer can be extremely possessive and feel threatened by Libra’s need to get out and relate to others, making them crabby, moody, or sullen. This can really disturb the fundamental Libra goal of peace and harmony, causing Libra to seek equilibrium in an airy detachment that creates further distance. Libra may find the careful crab stingy while Cancer sees Libra as extravagant and careless. Libra can find the watery world of their gentle crab simply too overwhelming and heavy. As an air sign, Libra experiences life primarily through the realm of thought, while water sign Cancer exists in the world of emotion. Libra may just not get what makes Cancer tick, and Cancer may grow frustrated or hurt by Libra’s apparent disregard for their feelings. Both may feel unappreciated or unable to really be themselves. Libra is known as ‘The Peacemaker’ but that doesn’t mean they are pushovers. Their internal struggle for fairness, balance and determining which decision is right can appear anything but peaceful. Two Libras can get caught in an endless loop of pointless debate that may be difficult to halt, and that includes arriving at important decisions. Once a choice is finally made, however, Libra is tenacious in sticking to it. Being a cardinal sign, both these two are leaders – they get things started. Their instinctive attunement to the other helps soften the urge to boss, but some conflict over who will lead and when will likely arise. Libra needs physical balance, also. Their systems can operate in distinct cycles of intense activity and resulting exhaustion, when rest is essential. If they push past their limits they can be very irritable, and a Libra couple should be mindful of each other’s cycles, nurturing and supporting their partner in appropriate ways. Venus rules pleasures of all kinds, and too much partying or indulgence in food or drink is a risk Libra should guard against. Two Libras on a binge can get out of hand fast. Because of their strong social instincts, they may trigger some jealousy in each other if they flirt too much at parties or simply give that impression - so irresistible is the Libra charm that others may take their attention the wrong way. Scorpio’s opinions are direct and Libra sees all sides of every issue. Libra can talk till they’re exhausted trying to get Scorpio to put themselves in other people’s shoes and see a different side, but Scorpio is a fixed sign and once their mind is made up it’s difficult to change. Scorpio sees this constant cajoling as an irritating waste of time. Libra seeks acceptance, beauty, harmony - they are the peace makers. Scorpio has no problem with conflict, being more interested in living each moment to its fullest than being ‘nice.’ Libra communicates verbally more than Scorpio, who conveys their feelings more subtly, or withholds all expression in silence. Reading a Scorpio can be almost impossible - they are masters of disguise. This can cause Libra to become insecure, prompting them to talk even more as they try to get Scorpio to open up and tell them what’s on their mind. There’s a slippery slope! Libra may need more outward signs of affection while missing the deeper signals that Scorpio sends, which hurts Libra and alienates Scorpio. Scorpio feels deeply and may also be hurt or disappointed by Libra’s inability to ‘get’ what’s going on with them. Communication between these two can be frustrating. Libra requires a great many social interactions, and while Scorpio loves a good time, they may weary quickly of Libra’s constant buzz of activity and withdraw. Sag can be unintentionally hurtful, their brand of truth telling often seems to lack any sense of how their remarks may wound the other person, and if Sagittarius values the precious love of tender hearted Libra - who cannot imagine being so insensitive – they’ll make a strong effort to think before speaking. Libra is the sign of relatedness – they are built for partnership and may want a commitment before Sag is ready. The centaur is a free roaming creature and may resist commitment until they are older. Individual chart dynamics will play into this, but these two can be happy partners without a formal commitment, if Libra can roll with that until Sag catches up. Libra weighs any and all decisions and choices heavily, and may also take their sweet time deciding what direction to take with the relationship. Libra should remember to give Sag their space, not every waking moment needs to be spent together. Sag can flirt up a storm, and Libra may get hurt and jealous if Sag doesn’t honor Libra with the respect they deserve. Both these signs are party lovers and the two of them together can veer into over indulgence if they don’t keep an eye out. For Libra and Capricorn, mixing business and social events can be challenging. Libran loves to socialize, and can fit more than one event in the calendar on the same time slot rather than miss out on something that is sure to be fabulous. Capricorns highest priority is business, and can always fit another meeting or task in their schedule, and unless the socializing is an event that they can meet someone useful for business they will probably decline. Going to the latest film preview or art exhibition is not necessarily on top of their list, even though, in a perfect world with a few more hours in each day, they would love to attend. With their highest priorities being polarized, it makes it difficult to spend quality time together, which leaves Libra to socialize and fraternize on their own, which can lead them into temptation, and infidelity is not something Capricorn will stand for. They both have a valid argument for doing what they do, but in the end they don’t get the support and understanding they both need. If one partner is more dominating it can crumble, which in this case, Capricorn will try and dominate and Libra will let them if it suits them, but at times Libra will want to take time to think things through, and Capricorn is not one to sit around and wait while someone sifts through the process of weighing up the pros and cons. Another area of frustration is in Capricorns eyes, Libra can be disparaging or disapproving in the way they are constantly trying to give helpful hints as to how they feel Capricorn could do something differently. To Capricorn it is a subtle way of control, and as Capricorn is the master of control they would know a controlling act when they see one, but of course Libra, is offended at the suggestion they have been anything but helpful. If things go wrong, it can really not got well, and do an about turn with Capricorn brooding and snarly, and Libra surly and ornery. Although both are fundamentally intellectual in their approach to life, Libra is extremely sensitive and relationship oriented. Aquarius is, above all, individualistic and can be pretty detached and aloof when Libra needs togetherness. Libra has an inquiring mind and although this is something Aquarius loves, the water bearer is not always open to being interrupted. Libra weighs both sides of any decision heavily and Aquarius may become annoyed and impatient when they feel action is called for. Once Libra arrives at a conclusion, however, they stick with it – Aquarius can seem totally set on a course of action and then switch directions suddenly, out of the blue, which can throw Libra way off into the bushes. Aquarius needs personal space and it’s up to Libra to judge when this is – not always an easy task, but Libra is in-tune enough to read their moods. 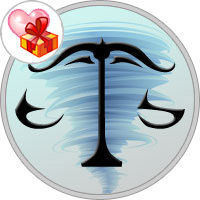 Aquarius will score points by indulging in some purely romantic gestures – not always their style, but these things go a long way with Libra, and are well worth it! As a cardinal sign, Libra is a natural leader – they get things started. As a fixed sign, Aquarius is great at sustaining an intention or project, but they absolutely will not take orders, so these two will need to put their strong mental compatibility to work resolving power sharing issues that arise. This is a very pleasant relationship, but there’s concern that no one will take control or action. They share similar traits on the outside – both are gentle souls who value peace, harmony, love and beauty in all forms. Beneath the surface, however, these two may not fully get just what the other one’s about. It looks good, but something’s missing. They can glide past each other without truly connecting. Both dream of a ‘happily ever after’ with a faith that few can match, but the Fishes may find Libra to be a little cerebral and distant, when they need a deeper, emotional union. Pisces like to over analyze everything and don’t make decisions quickly. They also need to ‘feel’ right as well as things logically making sense. Libra, because of their innate need to be fair, weighs up the pros and cons, making the decision process slow. Both of these two tend to avoid conflict, and dissatisfactions may linger too long without full disclosure.